Sometimes my kitchen has a glut of bananas. I can only eat so many each week, you know. Of course, I freeze them, add them to my cereal and make banana bread. As much as I love banana bread, sometimes I actually want to put my overripe bananas to some other use. I know that other people have similar issues. Fortunately, I learned an easy way to use up a few bananas when I took a class a while back (not affiliated with my baking class). The class, if you’ll recall, was about making souffles. The instructor named this as a low fat souffle, but I think she included it to reinforce just how easy it is to make a souffle. For these, a mashed up banana provides the majority of the base – no cooking necessary! It is thickened with a bit of cornstarch, flavoring is added and then egg whites beaten with sugar are folded in. The whole process takes less than 5 minutes, including the time to grease and sugar your ramekins. The taste is light and airy, with a nice banana-y richness. Once you’ve made the basic recipe, you can easily add other flavors or spices for variety. In the photo above, you can see ginger (with crystalised ginger), molasses and buttermilk, honey and chocolate (with mini chocolate chips) banana souffles. The chocolate souffles are very chocolatey. I make these often because they’re so easy and light. And because I have bananas. Lots of them. Coat 6, 6-oz ramekins with butter and sugar. Place on a baking sheet. Mash bananas and vanilla together. Sift cornstarch, cocoa powder and salt over bananas and stir well. Beat egg whites with sugar until they form soft peaks. Fold 1/3 of egg whites into banana mixture. When incorporated, fold in the rest of the egg whites – you can fold in some mini chocolate chips at this point, if you’d like. Spoon mixture into ramekins. Run your finger around the top 1/4 inch “collar” of the ramekin, removing any batter, sugar or butter, so that the souffle will rise straight and place baking sheet in the oven. Bake at 400F for 15 minutes. 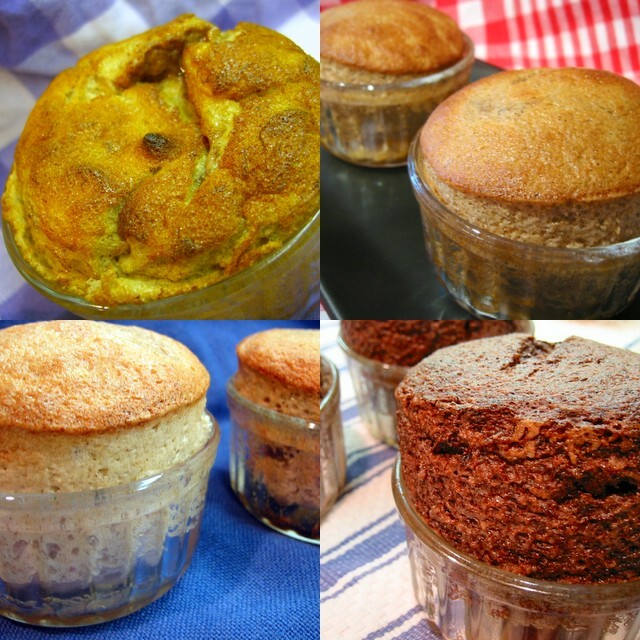 Wooo … I thought your souffle would just be banana. Turned out there’s chocolate! THAT I like! Thanks for sharing, Nic. This looks outstanding! I love a good banana bread, too, but have been searching for something else to do with the inevitable brown-speckled languishers in the fruit basket. I’m enjoying your blog – and feverishly printing off recipes to try! I’ve already made the baked falafel and found them completely delicious and quite easy. What another coincidence. I have way too many bananas on my hand. I’ll probably use one for a banana/Nutella challah panini (on the George Foreman of course!) and I’ll save some for souffle. They’d be really good for the banana sherbet from Alice Medrich’s Chocolate and the Art of Low-Fat Baking too. Celia – You’re very welcome. I go with the chocolate a lot, and make variations when I want a little variety. Jessica – Ooh, good idea! I’ll have to break out my ice cream maker and try it. I love your site and this recipe look delicious. I will be giving this one a try this weekend. Anthony – Thanks. I’m sure you’ll like them. You can’t go too wrong with sweet, light and easy. Fantastic. My husband repeatedly buys banana and forgets about them! I suspect it is because he knows I will make them into banana bread, which he loves. I’m so glad to have something else to make with them. Your souffles sound gorgeous! I really love this recipe and hope to make it soon, I just had a quick question… can you make souffles without a ramekin, or will it just not work? Looks so gorgeous. Question: what’s the weight/volume of the two bananas? This was very easy to make but unimpressive. The cocoa and banana just didn’t marry well in this dish. Very disappointing. Will not be making again.